While huge mainframe computers started to appear in the basements of large organizations and companies as far back as the 1970s, it wasn’t until about 20-30 years ago that companies of modest size began to use software running on new-fangled machines to help run the business. Some of the big companies of the time still exist today, Oracle, IBM, Apple, and Xerox – albeit with radically different business models and practices from that of a generation ago. Some big name products and companies have fallen by the wayside: Wang, Deck, WordPerfect, Lotus, and Psion. Back in the day, companies began to use discrete pieces of software: an Oracle database, a Visicalc spreadsheet on Apple II, a graphic design package running on a Mac. Sometimes these systems were linked by cables (who remembers token ring? ), but apart from accessing the same file stores, disparate systems never really integrated. It’s a surprise, therefore, that in today’s enterprise technology landscape, there’s still little effective interconnection between different systems. SAP and Salesforce systems might take care of ERP functions, but the Finance department could be running quite different software, as might the Human Resources department and others. And on every desktop, individual users are still using Excel spreadsheets (local or remote) and the workaround systems they’ve come up with to make their lives easier. In fact, there are so many different pieces of software running in even modest enterprises that a small industry has started up producing audits and catalogs of software discovered over extended LANs. But that, as they say, is quite another story. Highly expensive, labor-intensive IT departments are being deployed to create applications which interconnect & automate between these discrete software instances, hand-coding API access routines that let a database here ‘speak’ to a CRM there, and automatically populate information with a Finance Department suite there. Teams bandy about terms like SOAP and XML, and talk about RESTful-ness and token exchange. But now there’s a new way which companies of any size can build apps that better leverage their existing software systems and technologies. Low-code or now no-code platforms are helping bridge the gap. The quick wins are immediate efficiency gains for the business and a happier workforce, including a reduced IT overhead. More importantly your business can build the solutions it needs in days. What are the problems being faced by the business? Can we ask those affected what they’d like to see happen to solve the problem? * without committing to a nine-month development cycle, with multiple lengthy iterations, user-testing, UX design and cross-platform testing. Moreover, will it work on mobile? That final question is the elephant in the room, and it’s the question to which no-code platforms can say a resounding “yes”. Here at TechHQ, we’re focusing on three suppliers of low-code (or no-code) platforms which we think are worth your consideration – see below. It’s worth noting that each of the companies featured go beyond trigger-and-effect software, like IFTTT or Zapier. These packages have their place, of course, and are highly effective in their own right. But the software featured below goes a step further, and even beyond, some of the RPA (robotic process application) solutions out there. With no/low-code software, enterprises are building apps which are capable of abstracting the software into which the business has invested already, to create solutions to real-world problems. Some of the solutions featured are cloud-based, some in-house or both— or either. Each has a specific pricing or licensing model, and each comes with a catalog of available interfaces or interconnections with leading software platforms. From connecting the lowly .csv to the mighty Salesforce, low code solutions are business-oriented and problem-focused. In short, the apps create deliverables, not lengthy IT development discussion sessions. The tagline that Zudy uses is #BeQuick, but the speed at which Zudy’s platform Vinyl can be used to build and deploy powerful apps is only a small part of the overall story. The company’s ethos is that the employees in your business already know the answers to many of the problems you face everyday. The no-code solution Zudy offers means that non-IT staff and IT resources alike can use an intuitive IDE to build highly-complex applications which link, automate, draw out information, and integrate with all data sources in your enterprise landscape from literally hundreds of enterprise applications. Vinyl Apps developed can immediately perform cross-platform CRUD and run on any device or be deployed as Native mobile apps so they can be deployed anywhere. The platform,Vinyl was created as a change-enabling solution that’s squarely focused on solving business problems – eliminating the complexities of technology so the business can control and enable digital transformation. Vinyl is a powerful platform, easily learned and deployed by the business in collaboration with IT, bringing out the best in both. Vinyl means the business and IT can be true partners, developing sophisticated solutions while eliminating the complexities of technology, delivering apps quickly and efficiently. Global pharma, large enterprise insurance, manufacturing, consumer, retail, entertainment, finance, banking, and many other industries use Vinyl to get a competitive advantage. Vinyl is ranked #1 in application development software on g2crowd.com by actual users. Vinyl’s cloud, hybrid cloud or on-premise platform allows for complete flexibility in any implementation. To learn more about Zudy and Vinyl in more detail, click here. The Boston-headquartered OutSystems treads the line between a pure no-code solution and the ‘traditional’ development function. 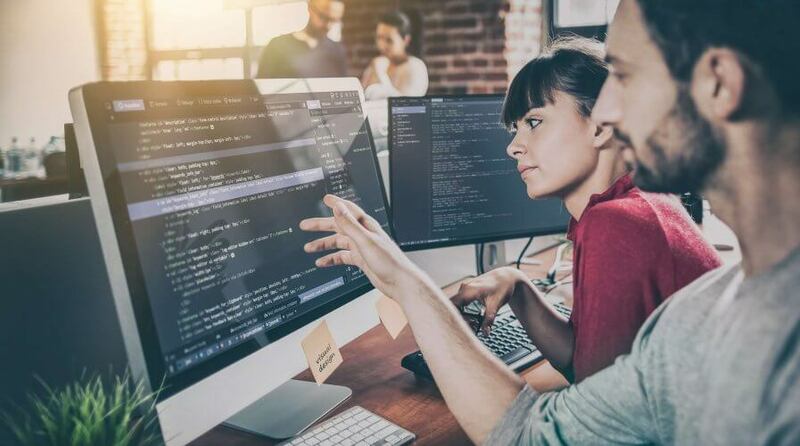 Users create apps in an IDE, but it’s an intuitive environment that lends itself to many integrations and uses without knowing much code – although a coder’s mindset will be required. There’s free access to the IDE to test out the solution, plus plenty of tutorials which can either be viewed as video, downloaded and digested or run from inside the IDE itself. If there are elements in your organization’s existing systems that OutSystems’s platform can’t handle, custom code can be added – perfect for adding code when IT needs to build specific functionality for highly specialized settings. Powerful apps are realized in a matter of weeks – rather than the (often) years that dev teams sometimes require, and the platform’s development agility means that apps can be edited and tweaked over the course of time, thus preserving a company’s agility in a business strategy sense. Outsystems has had accolades heaped upon it by the analyst firms Gartner and Forrester, and the company’s rapid expansion over the globe is a testament to large investments made by Private Equity in the company’s growth. Developers will need to develop the apps on a Windows machine however you will see the representation of the different app layers – back end, logic, and workflows through to the GUI – and both mobile & web apps are developed in their Windows environment and then compiled for either a native mobile or a web app. Appian knows that every company is unique, so even large, apparently malleable ERP systems represent a cost when it comes to needing to tweak and change them to a company’s particular requirements. It’s here that Appian believes its low-code app development platform finds its market: rather than pay for expensive internal development teams to create something unique (or pay more for outside consultants to do the same), with Appian, companies can very quickly create their own powerful, enterprise-ready applications. Beginning with a traditional flow-chart environment and true drag-and-drop, non-technical staff can use the platform to create impactful solutions. Three of the US’s biggest five pharmaceutical companies use Appian— and these are mission-critical deployments, with massive legal consequences if things were to go awry. Happily, this is yet to happen. What Appian has found is that its solution means that apps make a difference to the internal workings of its clients— removing repetitive double or triple data entry, for example. But the knock-on effects of even this, the simplest of process automation (between Salesforce and HootSuite, for example), makes massive differences for the better for Appian users’ customers and partners. And that’s what the company’s about. *Some of the companies featured on this editorial are commercial partners of Tech Wire Asia.